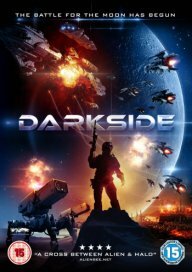 Darkside is out on DVD on the 11th July, and to celebrate we have a great competition for you and 3 copies on DVD to give away! It is the last, Great War. In the near future humanity has settled on the moon. Out of the wreckage of a troop transport, five soldiers on the way to battle find themselves stranded on the dark side of the moon. With depleting air and supplies, they have no choice but to start a dangerous trek through hostile territory. As their numbers dwindle and nerves fray, they make an amazing discovery about the moon that just might save their lives.